Confortable petit duplex dans immeuble historique situé place St Maurice (en face de l'hôtel de ville) à 2 pas du lac. Il est composé d'un salon avec canapé,tv écran plat, lecteur dvd, chaine hifi. Absolutely loved Annecy, the apartment was perfect for us, it had plenty of charm and was extremely comfortable. The location was excellent, being very close to the lake and all the bustling bars and restaurants. There are plenty of shops and supermarkets more or less on your doorstep. Being on the top floor you have quite a few steps up a circular staircase but after the first day or so you do get used to it and it was no problem at all for us, if anything it added to the charm of the building. Annabel, the owner of the apartment couldn't have been more helpful, always to hand with any queries we had and throughout the whole process of booking back in January she has helped where possible regarding information on airport transfers and excursions we wanted to go on, we can't thank her enough as it made the holiday very enjoyable. Overall I would highly recommend this apartment, the shower was amazing and the whole apartment was clean and tidy. It is definitely a 10 out of 10 from us. The apartment is up over 60 steps but you soon get used to it and there are wonderful views over the rooftops from the window just before you enter the apartment. The apartment is compact, cosy and has everything you need. The market is held just up the road 3 times a week so you can shop there and cook in the apartment and there are many restaurants nearby too as well as cafes. You are right in the hub of the old town We particularly enjoyed eating fondue, and perch. The lake is very close too so you can walk there, swim in the warmer months and you can hires motor boats and cruise on the lake. Annabel is very helpful and knowledgeable about Annecy. She used to live in the apartment. A fantastic character apartment near the lake and right on the edge of the old town. Brilliant! We arrived in Annecy by bus in the pouring rain and walked to the apartment. This would have taken about 15 minutes had my phone (Google Maps) not run out of juice at a critical time. However after some mis-direction we did arrive to a warm dry and welcoming environment. We loved our stay here. Being right on the edge of the old town and about 100 metres from the lake and gardens it is well placed for all Annecy activities. There are restaurants in all directions, we hired bikes just around the corner and the lake boats are across he road. The apartment is quite large and well furnished with all facilities required for self catering travellers. There is a Monoprix ( Grocery store) just up the road for supplies. It is however only suitable for able bodied people as there are 60 steps to the top floor doorway. Also the bedroom is on a mezzanine which has a steep spiral staircase to get to. If you can handle the stairs (we are in our mid 60s and managed OK) then you will love it. A charming and intimate lodging. 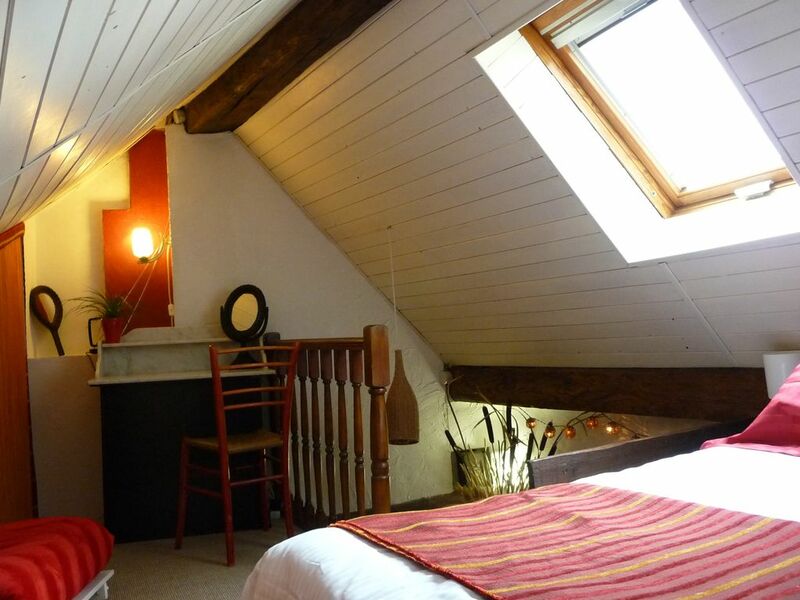 Annabel's loft apartment in the Centre of the city is an excellent place from which to explore not only Annecy but also the entire lake and surrounding countryside. The apartment is cozy and even though it is several floors from the ground was worth every step. The apartment is well furnished with everything one needs to enjoy a vacation. And Annabel has been the most courteous host we have had in all our home away rentals. She has extended herself to assist me on a variety of issues that made my stay memorable and successful. I recommend this accommodation to anyone seeking a City Centre location in this lovely city.